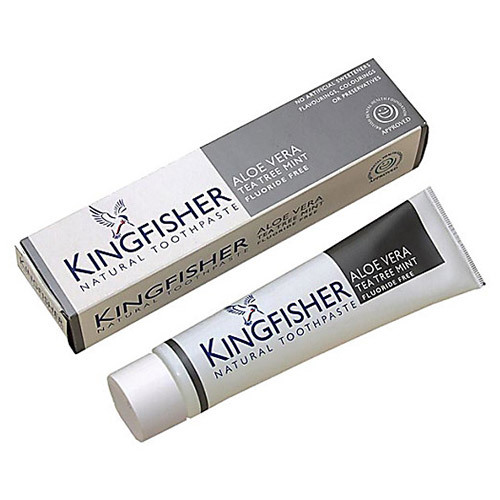 Kingfisher Natural Aloe Vera, Tea Tree & Mint Toothpaste is a fluoride free toothpaste with natural antiseptic properties from the added tea tree and natural soothing properties from the aloe vera. Calcium Carbonate, Glycerin (Vegetable), Aqua (Purified Water), Sodium Lauroyl Sarcosinate (Palm Oil), Hydrated Silica, Cellulose Gum, Mentha Piperita (Peppermint), Melaeuca Alternifolia (Tea Tree), Citrus Limonum, Aloe Barbadensis (Aloe Vera), Foeniculum Vulgare (Fennel), Limonene. 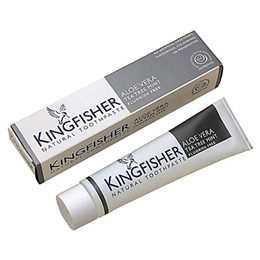 Below are reviews of Kingfisher Aloe Vera, Tea Tree & Mint Toothpaste - 100ml by bodykind customers. If you have tried this product we'd love to hear what you think so please leave a review. Been using this toothpaste for nearly a year and wouldn’t think about changing. Teeth feel nice and clean, and a nice minty after taste.